ANNAPOLIS, MD (August 20, 2012) – Mile-a-minute weed, Persicaria perfoliata(L.) H. Gross, is an annual Asian vine that has invaded a variety of habitats in the northeastern and mid-Atlantic states. First discovered in southeastern Pennsylvania in the mid-1930’s, it has since spread to as many as 12 mid-Atlantic and northeastern states. Its current range extends from Pennsylvania north to Massachusetts, west to Ohio and south to North Carolina. Habitats affected include forested floodplains, streamside herbaceous wetlands, and upland forests. Backyards and landscapes can also be easily invaded. 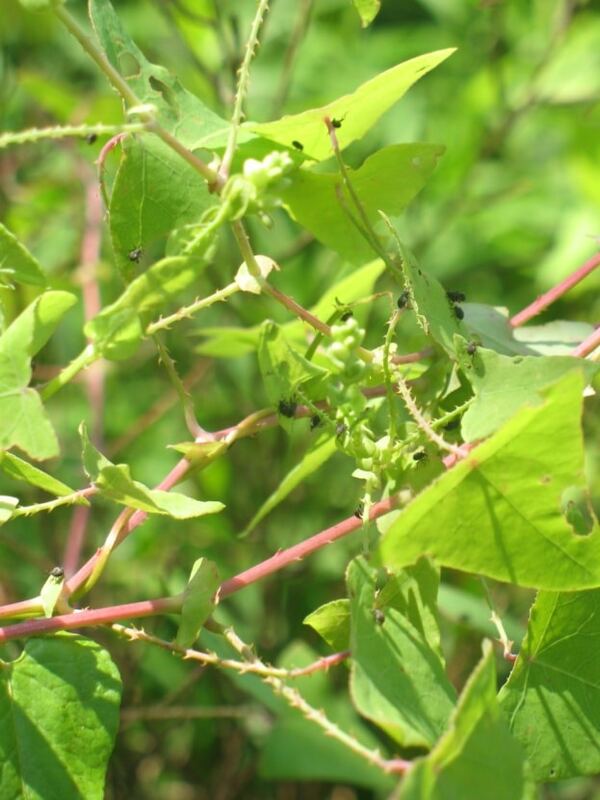 The vigorous vine, while only an annual plant, can grow as much as 15 feet in a single season, often choking out native or more desirable vegetation. Due to its sprawling growth habit, it is very difficult to control using selective sprays of herbicides without harming non-targeted vegetation. Mechanical control (i.e. hand pulling) is possible, but quite difficult and unpleasant due to the thorny nature of the vine. Even when an area is once rid of mile-a-minute weed (MAM), the seed that has fallen and remains in the soil can produce new generations of the plant for as long as seven years. Often the best management alternative in this type of situation is to search for an herbivore (plant eater) that specifically attacks the targeted plant. This is known as biological control. A search for a biological control agent to target MAM was initiated by the U.S. Forest Service in 1996. Field surveys and laboratory host specificity tests of a number of candidate species were originally conducted in China and subsequent testing continued under quarantine conditions in Delaware. A weevil, Rhinoncomimus latipes Korotyaev, was determined to be extremely host-specific to MAM, that is, these weevils are not interested in eating anything but MAM. The adult weevils are about two millimeters long, and are black, but may be covered by an orange film derived from plant exudates once they start feeding. Adult weevils eat small holes in young leaves of MAM and lay eggs on leaves and stems. After hatching, larvae bore into the stem where they complete development, then exit the stem and drop to the soil for pupation. Development from egg to adult takes about 26 days under laboratory conditions. The adult feeding does reduce leaf area on the plant, but the real damage that can lead to plant death is caused by the larva boring in the interior of the stems. Infested stems will shrivel and die, often before any viable seed is produced. After field and laboratory tests were completed, mass-rearing of this insect was begun at the New Jersey Department of Agriculture (NJDA) Phillip Alampi Beneficial Insects Laboratory, in Trenton, New Jersey. Original field releases were made under federal U.S. Department of Agriculture (USDA) permit in New Jersey in July 2004. Initial results were quite promising as weevils readily established on and caused significant damage to populations of MAM. The diminutive insects also proved to be able colonizers, spreading to patches of MAM weed as far as 6 miles from initial release sites in a single season. Encouraged by this initial success, the Maryland Department of Agriculture (MDA) partnered in a cooperative effort with researchers at the University of Delaware Department of Entomology and Wildlife Biology in a MAM biological control study. MDA applied for and received a federal permit to release the weevils beginning in 2007. The first Maryland releases of the weevil were made that same year in Howard County by the MDA in partnership with the Howard County Department of Recreation and Parks. Since that time over 12,000 weevils have been released at locations in 12 counties in Maryland ranging from the eastern shore to northeastern Maryland and from southern and central Maryland to the Blue Ridge in western Maryland. 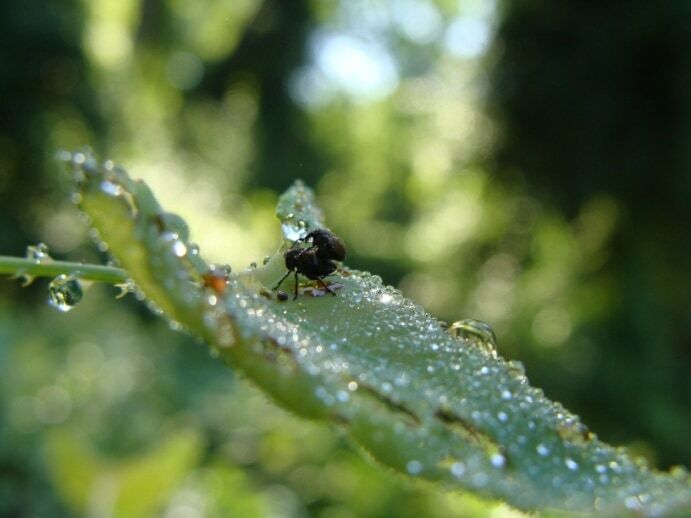 Because MDA conducts other biological control and beneficial insect rearing as part of Integrated Pest Management (IPM) programs targeting specific insect and weed pests, it began its own MAM weevil rearing program at the MDA Annapolis headquarters in 2009. Current funding for MDA’s MAM biological control program comes from USDA APHIS PPQ and from the Maryland State Highway Administration (SHA). MDA is concentrating the continuing weevil release efforts on SHA right of ways, and is trying to establish populations of the weevil at the edges of known MAM weed distribution in Maryland. Those areas are; southern Maryland, far western Maryland, and the lower Eastern Shore. The goal of the Maryland MAM weed biological control project is to have long term establishment of the weevil in all areas of the state where MAM weed occurs. If the weevils act as ideal biological control agents, and at this point all indications point in that direction, both the weed and the weevil will persist at low levels, locked in eternal combat. Invader of the Month insects, terrestrial plant. permalink.